Create custom guitar picks using household items like old credit cards. It's a recurring nightmare: you're backstage opening night of your first world tour, the crowd's roaring, begging you to come back and play one more blistering guitar solo. But you've got no guitar pick. What to do? Well, with the Pick Punch®, you can be sure that nightmare never becomes reality. 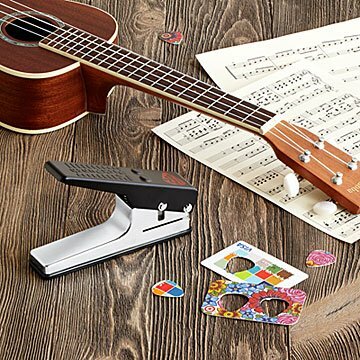 The Pick Punch® does exactly what it sounds like – it takes materials, like old credit cards or unused gym membership badges, and punches them into custom guitar picks. Keep it at home or carry it in a gig bag to be sure a new pick is never far from reach. Made in China. Pick Punch creates 1" L picks. He will enjoy making the picks he can use in playing guitar for pleasure and for services at his synagogue. This was a very clever addition to my daughter's gift of a guitar. She's been tearing through the house looking for old hotel keys and old credit cards! Such a great idea to both create guitar picks and recycle. Makes use of all those expired and club cards, upcycling. Also great for crafts. Always a pic onhand now! Excellent for your guitarist. My teenager was making his own picks when he was visiting family. This takes the work out of it and viola, he can make all the picks he wants out of whatever he wants. Great gift for my brother-in-law! Guitar Pick Punch! Our recipient loved it!!! Always thought it would be a great idea to have something like this. I mean, every time you turn around you are looking for your pick. If you have cats, you probably know what I am talking about. Plus, now you can take advantage of all the credit card offers you get in the mail!